My love of ice cream has now found a low carb version, and a new obsession. 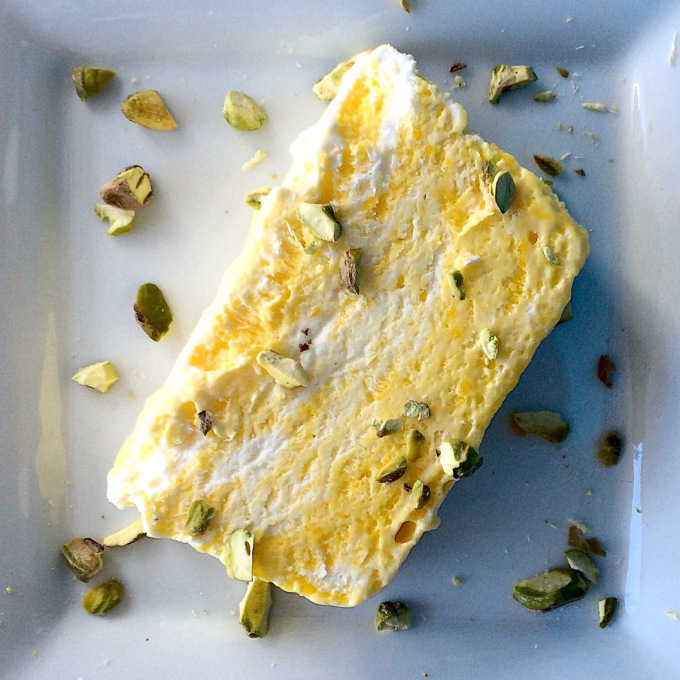 When I made this semifreddo, meaning semi-frozen it tasted great. It was sweet, like I had used sugar, tart from the lemons, and creamy. I’ve always said if I can make something using an alternative sweetener but it tastes just the same, I’ll stick with it. This sugar-free recipe will be a staple for me moving forward. Spray a metal loaf pan with nonstick spray. Line the pan with plastic wrap, allowing the excess to hang over the ends and sides. Whisk 1/2 cup xylitol, egg yolks, lemon juice, vodka, and salt in a large metal bowl. Set the bowl over a saucepan of simmering water (do not allow the bottom of the bowl to touch the water). Whisk with an electric mixer until the mixture is thick and doubled in volume. Set the bowl of custard into another bowl of ice water to cool completely. Using an electric mixer, beat the whipping cream and remaining 1/4 cup of xylitol in a large bowl until firm peaks form. Once the custard is cooled, using a spatula, gently fold the custard into the whipped cream. Spoon the mixture into the loaf pan. Fold the overhanging plastic wrap over the custard and freeze until frozen, at least 8 hours. Unfold the plastic wrap. Invert the semifreddo onto a platter and peel off the plastic wrap. When I made this, I portioned it out into slices and froze. If you are making this as a treat for yourself, or have leftovers, I suggest that you do this as freezing and refreezing over and over again doesn’t really work. Whenever I use xylitol I will post this warning. While it is a natural, sugar free sweetener that has many health benefits for humans. It is toxic for dogs. So if you have a furry member in your family, do not let them eat anything with xylitol in it.